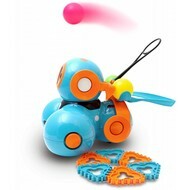 The Make Wonder® Dash and Dot robots are designed to teach children to play while playing. The robots are optimized for programming through free apps! The robots are already ready for use when they take you out of the box. For every age, applications have been made that offer your child new challenges every time. The Dash and Dot robots and expanding packages are available at RATO Education! We offer free, fast shipping from € 100! Make Wonder® Dash and Dot: Ready for Use! Make Wonder® is a brand that specializes in making toys to stimulate children's skills. The Dash and Dot robots are already ready for use in the box. All you have to do is download one of the apps. There are five different (free!) Applications that you can link with the Dash and Dot robots. Let your children use your smartphone or tablet and discover the technology of Dash and Dot! Dash is a robot that works via Bluetooth. You can use Dash anywhere, even if there is no internet connection! 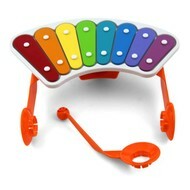 Dash can dance, sing, respond to sounds, and recognize objects in the neighborhood. Dash can even teach you new behaviors and sounds thanks to the free Wonder, Blockly or other apps that are available for free in the Google Playstore or the App Store. These apps are super user friendly and teach your children everything they need to program Dash. Dot is a smaller robot that is at least as smart as Dash. Dot plays games with your child, lets them move, but also teaches them the principle of programming and coding via the Wonder app. Dot can let you light up, dress up with LEGO® blocks to give Dot a make-over. You can also give Dot a different name to which he will respond! Together, of course , Dash and Dot also work. Dot can be used as a client for Dash and together they can handle the whole world. Dash and Dot can be bought together in the Wonder Workshop Wonder Package at RATO Education! The package is extra beneficial! You get a package of accessories, LEGO building brick connectors to give the robots a make-over, the Dash and Dot xylophone and the launcher to let Dash do different trick shots! Order your Dash and Dot robots at RATO Education! Something for everyone with the Dash and Dot robots! For every age and interest there are accessories and apps with which you can optimize and program the Dash and Dot robots. Do your children want to change the robots in a different way? 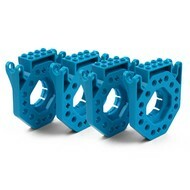 This is possible thanks to the LEGO® brick connectors! Do you want to use the Dash and Dot robots in the classroom? We have a special offer where schools only have to pay after delivery, but delivery is even free from € 100! Buy your Dash and Dot robots at RATO Education and enjoy many benefits!